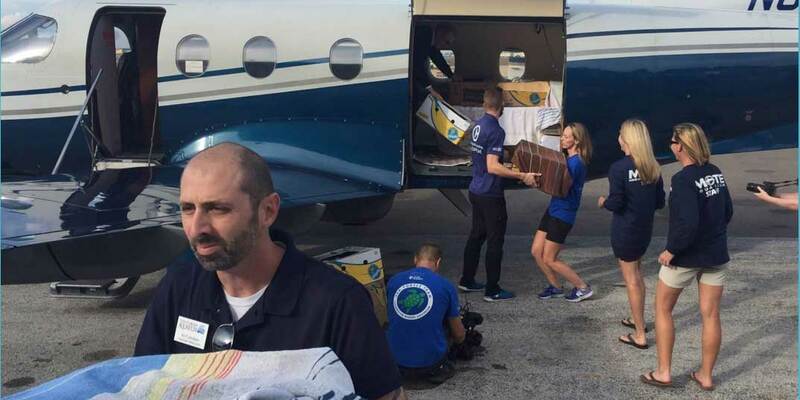 Animal care workers unload crated sea turtles from a business aircraft at a Florida airport. The creatures, weakened by their exposure to cold Massachusetts fall weather, will recuperate for several months before they are released back into the wild. With the temperatures dropping in the Northeast, “cold stunned” sea turtles are once again washing up on the beaches of Massachusetts’ Cape Cod, prompting general aviation non-profit charity Turtles Fly Too to request help from pilots and aircraft operators. Hundreds of the endangered reptiles, swept north on the warm currents of the Gulf Stream, become stranded each year. Left alone they would soon die in the cold weather. Instead, volunteers collect the turtles from the beaches and take them to the New England Aquarium, where their condition is stabilized. Available space at the aquarium is soon overwhelmed by turtles, mainly critically-endangered Kemp’s Ridleys, requiring them to be evacuated to marine animal care facilities in Southern states, where they complete their long rehabilitation process before being released. Over the past several years, general aviation has saved hundreds of the creatures, and the charity is asking pilots who fly south from the New England area to register for transport flights. The turtles typically are packed in boxes, which are then loaded on to aircraft at Boston-area airports for delivery to facilities in South Carolina, Georgia, and Florida.